Juba – South Sudan is developing the young country’s first ever migration policy with support from the International Organization for Migration (IOM). Through a three-day consultation, which began Wednesday (03/10), key Government stakeholders are setting priorities to be addressed by the comprehensive migration policy. South Sudan hosts thousands of migrants – estimated to be more than 845,000 in 2017, according to the 2017 International Migration Report – the majority of whom are from the East and Horn of Africa and are often travelling irregularly. Not only a country of destination for many migrants, South Sudan is a major transit country on the route to Northern Africa. This week’s consultative workshop was made possible through funding from the Better Migration Management Programme (BMM) and the Government of Japan. BMM is a regional, multi-year, multi-partner programme co-funded by the EU Trust Fund for Africa and the German Federal Ministry for Economic Cooperation and Development (BMZ). BMM aims to provide capacity building to improve migration management, particularly to prevent and address irregular migration, including smuggling of migrants and trafficking in persons. 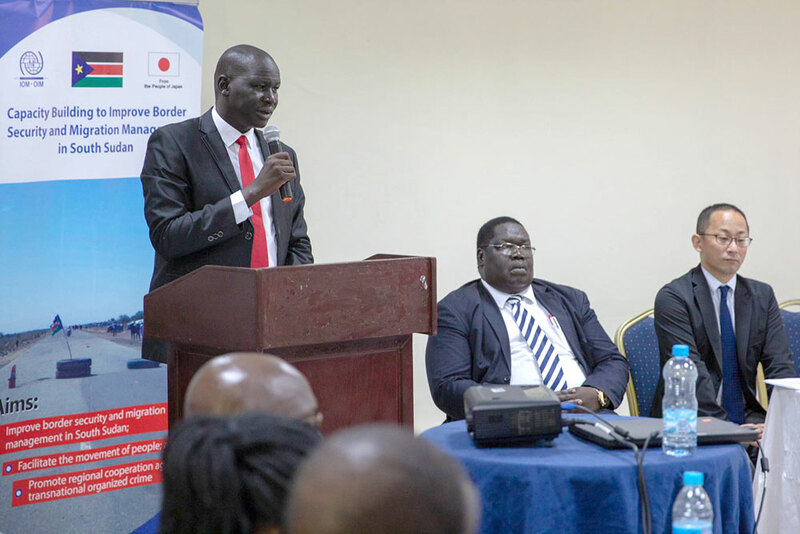 “We saw the need for South Sudan to come up with a migration policy when we realized that there were some legal loopholes,” said Riaw Gatlier Gai, South Sudan’s Deputy Minister for Interior, who officially opened the consultation. “We need to close these gaps,” said Gai. Migrants enter the country for a variety of reasons, a phenomenon described as mixed migration. Groups in the country include refugees, migrant workers and their families, unaccompanied migrant children and victims of trafficking. Those travelling to or through the country often enlist the services of smugglers to facilitate their journey. “Migration in itself is not a bad thing,” said James Pui Yak, South Sudan’s Deputy Inspector General of Police, at the consultation. “We South Sudanese have been to so many countries as migrants and refugees; that experience has shown us the benefits of migration,” added Yak. Migrants' vulnerability to abuse is heightened in humanitarian settings, particularly for irregular migrants. The impact of a crisis can be worse for them, as they cannot easily access information or aid. This is not only the case in South Sudan but also in countries like Somalia, Yemen and Libya. Discussions during the consultation centred on establishing correct facts and figures around migration in South Sudan, mixed migration, labour migration, and migration and development. “Regular and irregular migrants contribute to the country's economy, particularly through payments for business licenses and creating employment opportunities,” remarked Tya Maskun, IOM South Sudan Head of Operations. Maskun also added that due to its status as a member of the East African Community, South Sudan is a party to the free movement protocol, an agreement that should be at the core of migration policy. The protocol defines free movement as the right to enter and exit member states and move freely within them, subject to the states’ laws and procedures, with the aim of increasing Africa's economic integration. IOM began its migration management support to South Sudanese nationals in 2010 by facilitating their return and reintegration, for those who wished to participate in the historic referendum for independence from Sudan. The outcome of this week’s consultation will lead to another landmark step forward for the country.